13.5% alc., 4 cases, auction item, not for sale. · I love this nose! Beautifully composed scents of fresh cherries, strawberries and Asian spice. Tasty berry core highlighting cranberry with the slightest spice accent. Delicate and bordering on dilute, but packing a wallop of flavor. Supple tannins, zippy acidity, and perfectly adapted for the dinner table. Very good. 13.9% alc., $15.69. · A simple and straightforward moderately light wine with aromas of black cherries and black raspberries, sugar cone and oak. Nondescript in the mouth with simple cherry flavors. Soft tannins make for easy drinkability. Decent. 14.5% alc., $28. A new winery owned by John Sweazey located in the town of Sonoma. From the sustainably farmed J McK Vineyard located in the heart of Sonoma Carneros. · Pleasing red cherry and berry scents with underlying smoke and herbal oak. A medium-weighted wine replete with red cherry, cranberry, red hard candy and brown spice flavors with a bright riff of cherries haunting the lingering finish. The flavor profile reminds me of a Russian River Valley Pinot Noir. Good. 14.5% alc., $28. Destemmed, fermented in one-ton. Aged in French oak barrels for 17 months. · Very attractive scent of wild berries, oak vanillin and rose petals. Tasty mixed blue and black berry core accented by notes of cola, smoothly textured with supple tannins, and offering a refreshingly bright finish. Highly drinkable now and a charming wine with some flair. Very good. 14.4% alc., $28. Small lot fermented, aged 1 year in 30% new French oak barrels. · Complex aromatic profile featuring black cherries, herbs, forest floor, oak and a little barnyard. Dark stone fruits are lavishly oaked, the tannins are supple, and a firm grip of citrus-driven acidity brings up the finish. Needs food. Decent. 14.6% alc., $30. · An offbeat nose displaying scents of smoky oak, green brush, and exotic spices. More enjoyable in the mouth with a light core of darker cherry and berry fruits accented by notes of cola, root beer, oak and string bean. Lacks flair and interest. Decent. 14.6% alc., $35. Eight-year-old vines. · The nose is more savory than fruity while the wine is intensely fruity in the mouth. Very tasty core of raspberry fruit with an underpinning of baking spices and oak. Very satisfying and persistent on the palate offering a silky smooth mouth feel and showing perfect integration of alcohol, acid and tannin indicating age ability. Light on its feet and packed with flavor. Even more impressive the next day from a previously opened and re-corked bottle. 14.1% alc., $60.Anthony Austin is the winemaker. Aged in 50% new French oak barrels. Dark reddish-purple color in the glass. · A touch of reduction initially resolves with time in the glass revealing smoky and woodsy dark cherry and berry fruits. The black raspberry and black cherry fruit displays an impressive fullness and roundness in the mouth, but the wine offers little nuance or flavor impact. The tannins are beautifully integrated and the refreshing finish is bright with citrus peel acidity. A linear, fruit-driven wine that may offer more interest given more time in the cellar. Good. 13.6% alc., 323 cases, $68. A collaboration between long time friends Elisabeth and Claude Koeberle and Beth and Donald Plumley. The name, Soliste, is derived from the special barrel or soliste that Burgundian winemakers reserve for their family and friends. 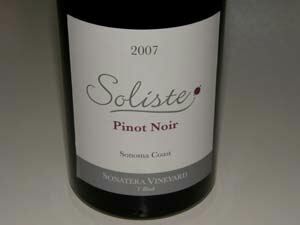 Sonatera Vineyard is located on a ridge near the cooler part of Sebastopol. Clones 115 and 777 planted in Goldridge sandy loam. · Darkly colored. The nose is dominated by savory spices including cardamon. 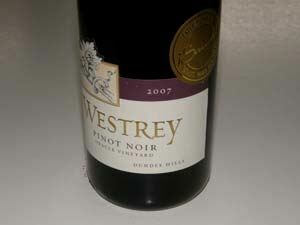 The thick plum and blackberry fruit is set off by notes of anise, vanillin and cream. Very silky in the mouth with subtle fine tannins. Good. 14.7% alc., pH 3.57, 47 cases, $65. A partnership between restaurateur Charlie Palmer and winemaker Clay Mauritson of Mauritson Winery in Dry Creek Valley. 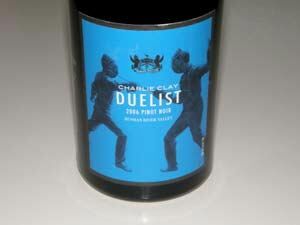 2006 was the inaugural vintage of Charlie Clay wines with the Duelist being a reserve bottling. 85% Dutton-Campbell Vineyard and 15% Bacigalupi Vineyard Wente clone. Available on the wine list at Charlie Palmer’s restaurants. 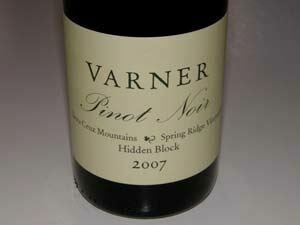 · A riper styled Pinot Noir which approaches but never reaches overripeness. Aromas of macerated strawberries, sandalwood and sweet oak. Juicy essence of berry compote trending to the red and blue berry spectrum with substantial oak in the background. A well-crafted wine that aims to please with vigorous fruit, soft tannins, bright acidity and some persistence on the finish. Good. 14.5 alc., $27. · Perfume of overripe strawberries, raisins, marzipan and oak toast. The slightly roasted and brown-sugared fruits are buttressed by soft tannins creating a very smooth mouth feel. Decent. 12.4% alc., $50. Unfined and unfiltered. · One look at the very dark reddish-purple color in the glass and you know what’s coming. Intense and powerful aromas of blackberries, plums and cardamon spice. A muscular wine with a full on load of dense, deep, thick and almost jammy well-spiced dark fruits. A quirky wine with a big booty that packs in plenty of flavor without the heat. Over the top for me. Decent. 15.1% alc.. · Deeply colored. Bright dark roasted fruits with noticeable oak char on the nose. In the mouth the wine is packed with dense dark stone fruits with some sweetness evident from the alcohol. Thick and chewy with bold tannins and a grainy texture. An off-putting chemical note brings up the aftertaste. Unsatisfactory.